JIJIGA, Ethiopia, Apr 3 2013 (IPS) - For over two decades Somali Region, in eastern Ethiopia, has been devastated by a grueling insurgency. Trapped in a time warp, it has been forgotten and underdeveloped. But in the last few years, thanks to the increased security here, a five-star hotel, eco-tourism ventures and even a large abattoir are being built by the former diaspora community. This comes after the regional government encouraged people to return and support development in this Horn of Africa nation through global campaigns conducted in countries like the United States and the United Kingdom. For many who remember Jijiga as a forgotten, war-torn region, photos of new hospitals, roads, schools and bridges – though still very few in number – have inspired many to take what they felt to be a brave step: to return home to see the development for themselves. In the last two years, over 300 people have returned, part- and full-time, to work on various projects. According to Axmed Maxamad Shugri, head of the government’s Regional Diaspora Office, which assists those returning, the main reason for so many staying away from the region for so long is the misinformation spread by the Ogaden National Liberation Front or ONLF. “For a while I did not think I could even come here myself, but ... I discovered there was a chance to do something and I have been very encouraged by our progress so far,” surgeon Dr. Mahad Musse, who grew up and studied in Finland. The ONLF is largely made up of Ogaden people, a Somali clan that has fought for an independent state here since the 1991 fall from power of Ethiopian dictator Mengistu Haile Mariam. The ONLF is now in peace talks with the Ethiopian government. But after it took up arms, what followed was nearly two decades of a bloody insurgency, with civilians often being targeted by both sides. As a result, various aid agencies were restricted from working in the region, where the residents endured several devastating droughts. Many of the five million people who inhabit the region live simple pastoralist lives, and the lack of peace and water severely disrupted their fragile existence. But a regional police force or state militia, the Liyu Police, which is made up of soldiers from the local communities, has managed to severely decrease the ONLF’s strength in recent years, according to the regional government. In the face of criticism by activists for human rights abuses, Liyu leaders told IPS they are making efforts to reform the force. 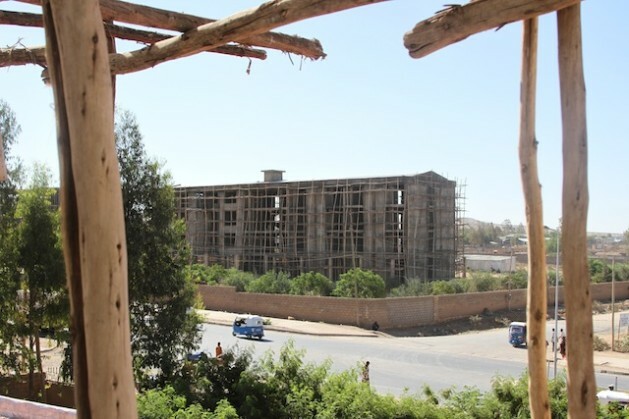 Mohamoud has pooled together investment from his extended family, who have sought asylum across the world, and is building Jijiga’s first five-star hotel. The same sentiment was shared by another recently-returned investor, Jamal Arab. He and his family sought asylum in the state of Minnesota in the United States, where he worked in a manufacturing company until recently. In Fafan, a village 30 kilometres away from Jijiga, Arab and four other investors are building a huge abattoir. Arab added that nothing would have been possible without the new road which runs through the village, connecting it with Jijiga and major cities close to Ethiopia’s capital. Through the centre of Jijiga runs a wide modern highway, fitted with tall efficient streetlights. Building projects are dotted all the way along it, through the length of the city. Shopping centres, five-star hotels, and new restaurants are being planned, with construction having started on many. The city now has a new hospital and a university, and regional government officials say it is a new beginning for the region. “Now you can see we are booming, the region is safe, it is time for everyone to come back, invest in their home, and help their people,” Abdullahi Yusuf Werar, the region’s vice president, told IPS. It’s not only investors who are moving back. A number of people have returned to begin setting up NGOs, or to bring other skills to the region, which they acquired abroad. Dr. Mahad Musse, who grew up and studied surgery in Finland, has come back to set up a surgery clinic in Jijiga. The region, however, remains impoverished. Drought is expected again this year, which would have lasting effects for people in the region. While most of the recent developments might benefit those in the cities, the vast majority of the five million people who populate the region still live far from water sources, and have no electricity. The rebels may have been pushed out of the cities and now operate in smaller numbers, but they remain present throughout the region. The momentum of development will depend on the dedication of the regional government, the skills of the diaspora, and the willingness of the ONLF and the Ethiopian government to find peace before the region can really develop in a way that will benefit all. Its a good start to the long way for reconciliation and I am hopeful the Govt and the rebels will compromise to find a pragmatic solution. the region, the regional state might be heading to another form of conflict. his clan in a number of areas. would give a serious thought for such useless writing. to commemorate the passing of the iron lady.